A modern muscle car delivers an unbelievable amount of power while retaining outstanding drivability. The LS, Coyote and modern HEMI all produce terrific power while idling smoothly, chalk up great mileage and lack the leaking tendency of their predecessors. Even better, extra power can be harvested from these engines simple bolt-ons of parts – like coil packs. 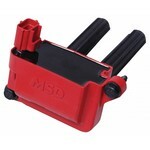 MSD offers coil packs in three different series for late-model muscle cars and trucks. The economy Street Fire brand, the entry-level MSD Blaster Coil and the premium-output Pro Power line, with the most available output, ensure that the right coil for you is available from MSD. Each series has been designed and tested by MSD for improved spark energy and improved coil efficiency to deliver overall performance improvements. When adding other upgrades, like cold air intake systems, making programming tweaks or installing a better-flowing exhaust, the improved spark output will aid in maximizing the performance benefits. Turn up your late-model muscle car with MSD and Street Fire Coils!